The 40Ar-39Ar method has been used to date bedrock from beneath the Caribbean Sea but results have been kept hidden from the public. In the mid-1960’s the United States Geological Survey made an astounding announcement that should have changed the accepted geological history of the world. The Survey reported that underlying the entire Caribbean Sea, beneath thousands of feet of sediments, is a fresh appearing, coarse-grained basaltic lava that will not yield a Potassium-Argon (K-Ar) date. Despite the fact that this same type of rock has provided K-Ar dates from around the world, on which a major part of the Geological Time-Scale has been based (from late Precambrian to Recent), USGS scientists were unable to obtain a K-Ar date from it. The USGS eventually reported, in the absence of evidence, that this was due to “…a special type of alteration.” They never allowed that one possible reason for this discovery could be that the age of the rock is less than the sensitivity of the method being used, although honesty alone would have required them to acknowledge this. But, perhaps because sediments overlying the basalt formation had been mapped by their own geologists as Tertiary in age (66 to 2 million years), while a comfortable sensitivity limit for the K-Ar method is only around 100,000 years, they omitted this possibility, and an effective conspiracy of silence prevailed. When rocks beneath the Caribbean Sea could not be dated by the K-Ar method the USGS stated this was due to “…a special type of alteration.” So what is their explanation now that these rocks have been dated by the newer and more sensitive Argon-Argon (Ar-Ar) method? Is the word of the USGS credible, or not? Although the newer and more sensitive Ar-Ar method was not being used at the time, USGS scientists would have been aware of its impending availability and could have applied the new technology later had they not been so dedicated to defending their orthodoxy. This is a serious charge against a proud organization, but the implications for the science of geology are huge. The Geological Time-Scale serves as a framework for the science of geology, accommodating its history and rock sequences. Several dating procedures have been used to determine the great range of ages, but except for older Precambrian rocks and the youngest of Recent rocks, much of everything in between has been dated by the K-Ar method wherever volcanic rocks were available. This was the first time it hadn’t worked! Readers without knowledge of geology will likely be unfamiliar with age-dating methods that are applied to rocks, so the following account of the two most common radiometric methods provides a brief description. An understanding of these procedures, however, is not necessary for an appreciation of the main story. All potassium on Earth occurs as one of 3 isotopes, one being radioactive 40K (Potassium) which has a half-life of 1.25 billion years. After that time, half of the original amount will have been changed into Calcium and Argon, and 10.9% of the daughter products will consist of 40Ar (Argon), which can be measured by mass spectrometry after a prepared rock sample has been melted in a vacuum furnace. Argon does not combine chemically with minerals in the rock, and if conditions are right it will be held tightly within the rock until released during testing. The 39K isotope is generally measured by a standard laboratory method such as atomic absorption spectroscopy and the result converted by a formula to 40K. The ratio of 40K to 40Ar is directly related to the time elapsed since the rock crystallized. The method is relatively insensitive and by a rough rule of thumb is not applicable to rocks much younger than 100,000 years. A sample is placed close to the core of an atomic reactor which converts stable 39K into radioactive 39Ar by neutron irradiation, and the process is standardized against a rock sample of known age. The sample is heated and degassed in a high vacuum mass spectrometer, releasing radioactive 40Ar with 39Ar and other gasses. The 40Ar increases logarithmically with the age of the sample since it crystallized and the 40Ar to 39Ar ratio is entered into an equation to provide a date. Samples are crushed and feldspar fragments selected under a microscope for treatment. This is why a fresh-appearing relatively coarse-grained rock, like the basalt underlying the Caribbean Sea, is preferred for determining ages used to confirm a significant part of the Geological Time-Scale. The USGS apparently did not proceed further with their investigation of the rocks beneath the Caribbean Sea, and if they did submit samples for 40Ar/39Ar testing, the results were not released to the public. Today, this important discovery does not appear in any geology textbook and has so effectively been kept hidden from modern students of geology that the recent Ph.D. graduate manning the popular ‘Ask a Geologist’ desk on the USGS website when I inquired was unfamiliar with it. In the late-1960’s the drill-ship Glomar Challenger began its worldwide voyages under the Deep Sea Drilling Project and in the eastern Caribbean Sea, basement samples from the Venezuelan Basin and the Columbian Basin were recovered. Three decades later, in a co-operative project among five scientists, from four well-respected universities and research institutions, samples from both basins were lumped together with other, widely spaced samples that had been collected on land from around the Caribbean, and all were assigned an age of around 90,000,000 years. In light of the USGS experience, this begs the question of how the ages of these Basin samples were determined. 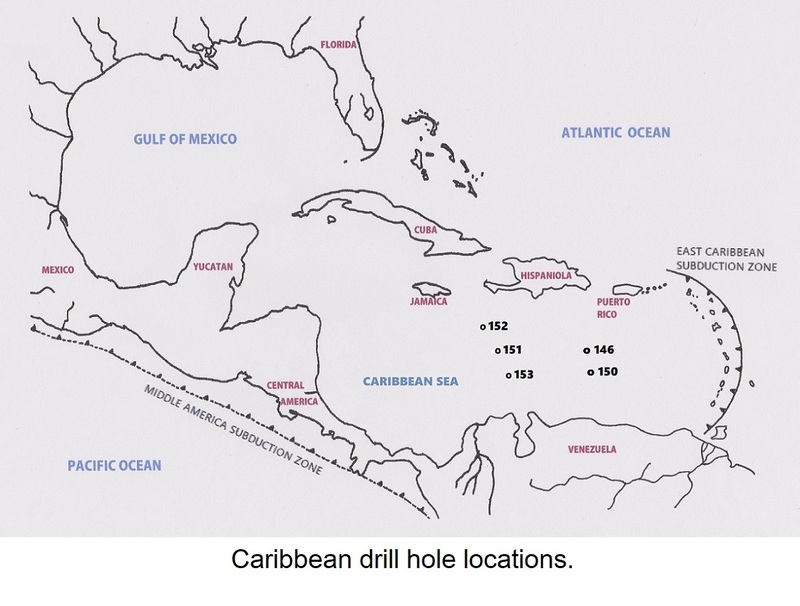 The deep sea drill-hole samples in question would not have been available to the USGS when they issued their news release in the mid-1960s. Nothing, however, would have prevented the Survey from testing these samples when they became available, and at a time when the 40Ar/39Ar dating method was in common usage. The USGS would have been fully aware of such important samples, and would not have encountered difficulty in obtaining access to them. 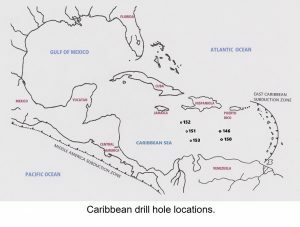 In a report published by the five scientists, entitled ‘An oceanic flood basalt province within the Caribbean plate’, it turns out these deep-sea drill cores were tested by the 40Ar/39Ar method but failed to provide results that could be used to support their pre-conceived theories. The sample results were discarded, the scientists stated, because they were “less well constrained” than samples collected from the land. Sometimes, the anticipation of scientists can conflict with reality after the results come in. They then have a choice: they can either report their actual results which could have consequences for their financial grant support, or they can hide them to support their thesis, For whatever reason, these scientists decided not to release the age dates that their tests had provided. Instead, they used the alleged age of fossils from overlying sediments which, happily, provided the exact age their thesis required. These scientists refused to accept results of a method that was widely accepted because the outcome would have presented a challenge to their unwavering faith in their orthodoxy. Since the overlying sediments ‘had to be Tertiary’ in age as they all agreed, the basement lavas couldn’t possibly have crystallized as recently as 10,500 years ago which, I am claiming, is their actual approximate age. The problem for the scientists is that such an age is well within the range of 40Ar/39Ar dating so that if the analyses were carried out correctly, results reported to them were around 10,500 years. There are certain cases in which the determined age may not be the real age of the geological event, but this is usually because unreliable sample material is used. Also, step heating, providing several progressively increasing dates, can result from slowly cooling magma. As stated above, the rock that was available appears to have been ideal. What is so serious in this case is that the scientists evidently had such faith in their thesis that they felt entitled to discard any results that failed to agree. Sediments are supposed to have accumulated in the ocean depths at a more or less constant rate so that 40 meters of deposition can be regarded as representing a million years of deposition. Considering scouring at some locations and deposition in others, as shown by up to 10,000 meters or more of sediments on top of young volcanic basement rocks in the Caribbean Sea, it is obvious that conclusions based upon the sedimentary record can easily be misleading. Sedimentary columns from the ocean depths cannot be regarded as complete records. Uniformism must be set aside in favor of catastrophism. The sedimentary record, of course, has major implications for paleontology. If fossils in sediments that were deposited about 10,500 years ago are being used as proof of the sediments having been deposited 90,000,000 years ago, then the science of paleontology has a problem. If the fossils are present, and if it should be claimed that the sediments have been reworked, which they obviously were, and that the fossils really are that old, the fossils still don’t date the time of deposition of the reworked sediments. This was the only reason for introducing fossils in the first place. Of the different states of matter, Impact Geology is concerned primarily with liquid and solid. The change of state most familiar to us concerns liquid water and its solid phase ice, which is almost unique in that the liquid phase is the denser of the two. Life on Earth would be very different, and might not have evolved far at all if this were not the case. In practically all other substances it is the solid phase that is denser than the liquid, and so it is with all rock. The temperature of Earth’s crust increases with depth, but the rock is prevented from becoming liquid by the weight of overlying rock. In order to melt, its volume would have to increase, and there is no room to permit this. At sufficient depth, a huge volume of rock remains close to its liquid temperature and requires little additional energy to melt when the weight of the overlying rock is reduced, if only for an instant. This happens when a large (really large!) 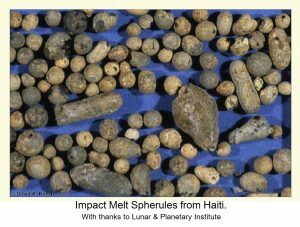 asteroid impacts the Earth. With a sufficiently massive jolt, and with additional energy from the impact itself, a convection cell exceeding the volume of the asteroid by millions of times develops instantly. Carl Sagan stated: “Astronomers do not object to the idea of major collisions, only to major recent collisions.” The reason for this statement is simply that Sagan was unable to recognize the sites of major recent collisions. The list of impact sites recognized by geologists has grown considerably over the past few years, but “the largest listed verified impact crater on Earth” in Wikipedia in 2018 is the Vredefort Crater in South Africa, which measures less than 200 miles in diameter. There are much larger sites all over our planet, hiding in plain sight! I will describe the general process of their formation and identify actual examples. The first example described is the asteroid that most recently moved Earth’s geographic poles, approximately 10,500 years ago. 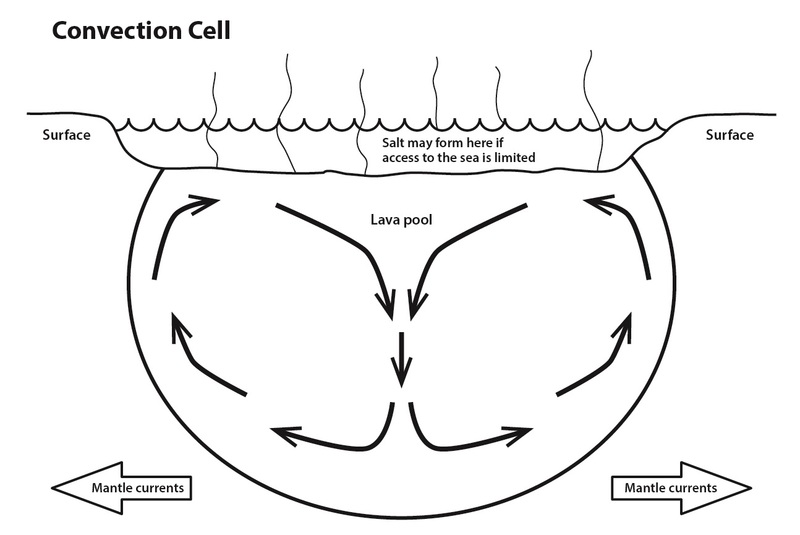 Upon impact, deep ascending currents develop immediately within the convection cell due to rapid expansion as the rock becomes liquid, sustained by the high temperatures of the surrounding rock. Boiling water in a pot on a stove provides an example of a convection cell, with water rising in the center and descending down the wall of the pot (a small pot on a large burner might not show this). In this convection cell, the motion is opposite due to the high temperature of the surrounding rock. The upward flow of magma undercuts the cooler surface crust, increasing the diameter of the lava pool, and resulting in a circular outline regardless of the impact angle or the shape of the asteroid. If the impact is on oceanic crust, as most are, the undercut crust sinks and melts. On continental crust, a denser rock may be added from below to form a lava pool of intermediate composition. Islands of lighter crust may then float upon the molten lava, sometimes becoming frozen in place when the lava solidifies. The largest impact sites generate three radial faults, forming a ‘triple junction’. Two of these faults can extend thousands of miles beyond the lava pool, which will have an area hundreds of times that of the impacting body. In oceanic crust, resulting currents in the mantle may travel across entire oceans, and large land masses may be moved great distances as a result. These land masses, termed ‘terranes’, are directed in their travels by these major faults. The third radial fault, the ‘aulacogen’, always terminates at the edge of the convection cell. A subduction zone, where one tectonic plate plunges beneath another, can develop along a limb of an ancient impact site which might not have been previously evident. 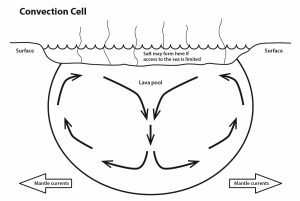 Smaller impacts generate two usually parallel faults from the edges of the convection cell to the closest major lineament or subduction zone. A massive surge of material in the mantle is confined between these faults, while massive volcanism may result along a nearby mid-ocean ridge. Scientists have stated “A large impact must have left some evidence.” and I cannot disagree. A problem arises, however, when they look at the evidence and it means nothing to them. Many scientists, it seems, find nothing wrong with the concept of a continental ice cap, over 3,000 miles (4,800 km) in diameter, and a couple of miles thick, forming “…on one side of the planet in the mid-latitudes.” Well, they might say, “It was during the ice age.” Only the ice cap over north-eastern North America didn’t form at those latitudes at all; it formed around the North Pole, where most sensible people who are not scientists would expect it to form. Prince Charles Island, north of Hudson Bay, was close to the North Geographic Pole until about 10,500 years ago. The position of the former North Geographic Pole has been estimated based on the known extent of the Polar ice caps in the northern and southern hemispheres. After a major asteroid impact, the world continues to follow the same orbit as before, and the orientation of its rotational axis in space remains the same as before. 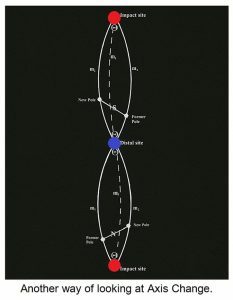 A temporary, secondary axis develops through the new equator, and the Earth rotates about it, along a meridian, even as it continues to rotate about its major axis. The result is that points occupying the geographic poles are moved to lower latitudes, which means closer to the equator. The concept can be understood by holding a model globe and rotating it slowly about its axis, while at the same time turning it along a meridian. 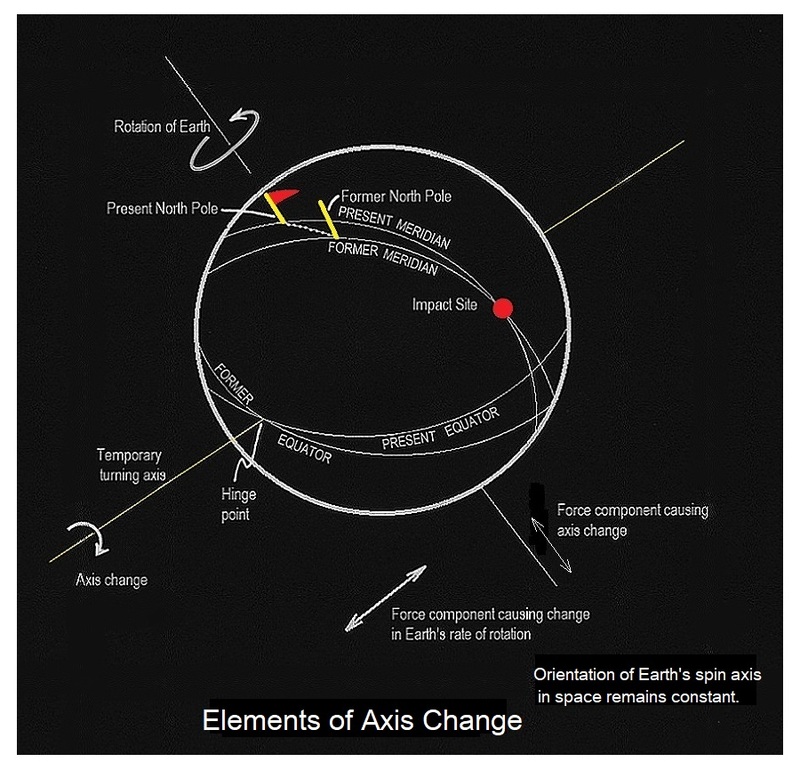 Keep in mind that the orientation in space of Earth’s actual rotational axis does not change. 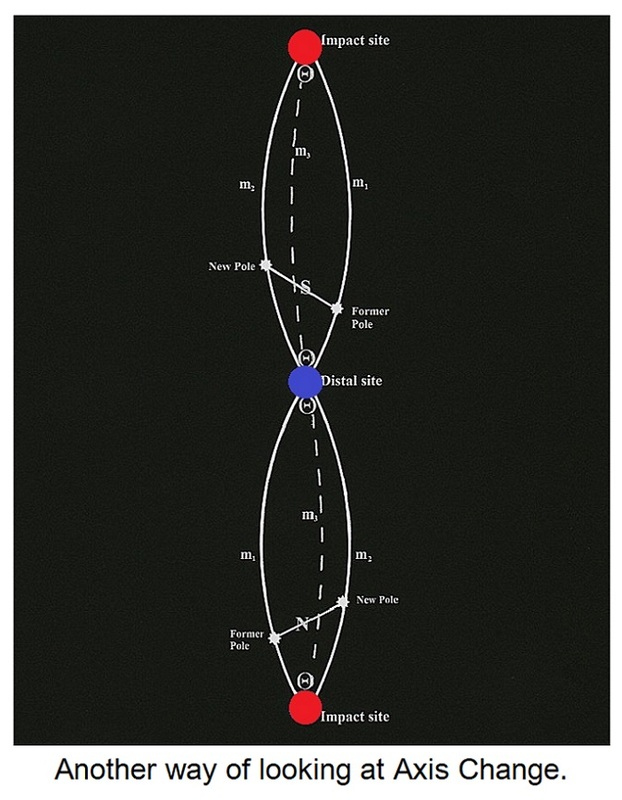 The force of the impact of the asteroid on the surface of Earth can be resolved into two component forces operating at a right angle to each other. One force will be aligned with the meridian that passes through the impact site and causes the geographic poles to be rotated to lower latitudes. The second force, at a right angle to the first, causes the Earth to increase or decrease its speed of rotation. Given the disproportionate masses involved, the effect of the second component force on Earth is relatively small. The length of a day and the number of days in a year change only slightly, while the length of a year remains the same as before. Only two points on the surface of the Earth retain their same latitude and longitude. These ‘hinge points’ are opposite each other where the new equator crosses the previous one. Two other points retain their longitude but their latitude is changed. 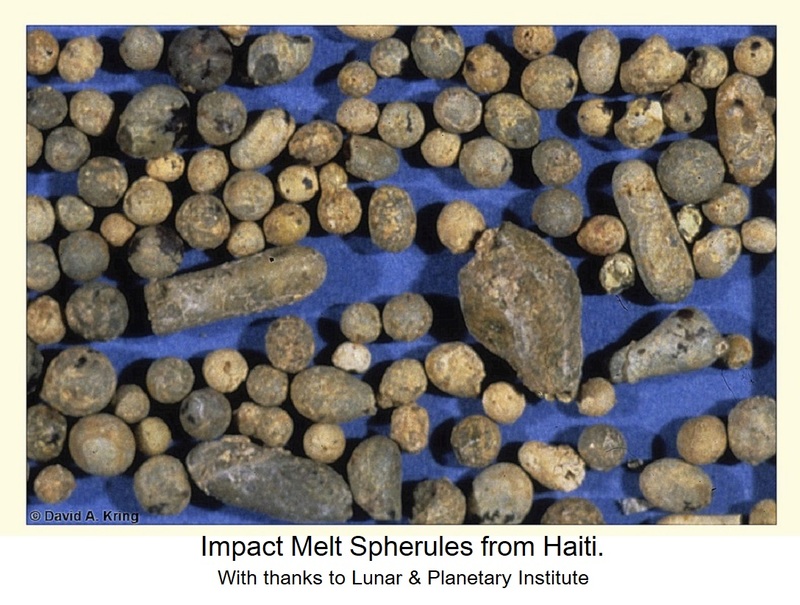 These are the impact site and its reciprocal point on the opposite side of the Earth. 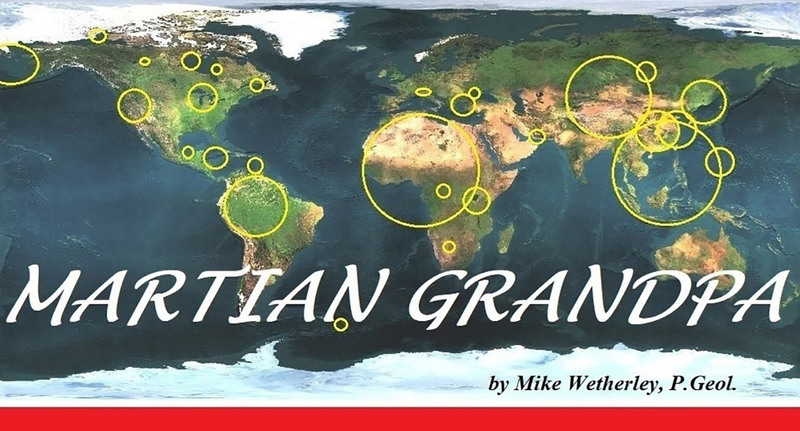 All other points on the surface of the Earth will have their longitude and latitude changed. All points on the surface of the Earth will have their longitude and latitude changed except for the four points given above. The planet continues revolving about its main rotational axis as the change occurs. The initial and final meridians, between which the latitude change takes place can be seen to form an envelope. The envelope pictured has been removed from the globe and flattened out so that the two ends represent the same point. Meridian m1 connects both former geographic poles through the impact site, while meridian m2 connects both new geographic poles through the impact site. The dashed line m3 represents any intermediate meridian as the change takes place. The two points where the temporary turning axis exited the planet during the most recent axis change were located in central Africa and in the Pacific Ocean, south of the Hawaiian Islands. These were the only points on Earth’s surface during the last axis change to not experience any change of latitude or longitude. The angle Θ (capital Theta) is a measure of the longitude through which the Earth rotates during the axis change. By applying Earth’s present rate of rotation, the approximate time taken by the change can be calculated. Straight lines connecting the former geographic poles to the current poles on the diagram show the paths followed by the poles during the change. Both are actually arcs of a circle (an equator) whose poles are points where the temporary rotational axis breaks the Earth’s surface. One day, scientists will calculate the force applied by an asteroid which moved the poles of the Earth. First, however, they will have to learn it can happen. The most recent major impact, which formed the Venezuelan Basin in the eastern Caribbean Sea, impacted the Earth close to what is now 14.1o north latitude and 65.4o west longitude, about 10,500 years ago. The date of this event can be determined in a number of ways. One is from the 14C dating of woolly mammoths in the permafrost of the Arctic, and we know it was summer in the northern hemisphere because some grazing animals had flowering plants in their mouths. The lava surface, beneath sediments of the Caribbean Sea, can be dated by the 40Ar/39Ar method. Samples have already been collected and had their ages determined and it is time for scientists to be compelled, if necessary, to make these results public. The former geographic poles were moved some 22o closer to the new equator, and the ‘ice age’ in the northern hemisphere came to a close. Earth turned through about 100 of longitude, indicating a duration of 40 minutes. Points formerly situated at the geographic poles now occur at about 68o north and south latitude, and the former and present poles are approximately 1,650 mi. (2,650 km) apart. This means the change took place at a speed of 2,475 mph (close to 4,000 kph), which is about 3 1/2 times the speed of sound in air at sea level. Scientists working for government surveys, research institutes and universities try to persuade the general public to accept their beliefs, and they claim that the Caribbean Sea, or just about anywhere else on Earth for that matter, is millions of years old. In light of this, just how reasonable can my claim be that the Caribbean Sea did not exist in anything like its present form until about 10,500 years ago? The Windward and Leeward Islands in the Caribbean Sea produce an almost perfect ‘island arc’ formed by some of Earth’s youngest volcanos, which continue to erupt from time to time. Every one of them and every nearby volcano beneath the sea, formed within the past 10,500 years. They skirt the periphery of a deep pool of former lava, some 650 km in diameter, which resulted from the impact of a major asteroid. A reasonable guess for the size of this asteroid, I suggest, is 20 km (12 mi.) in diameter, making it comparable in size to the inner Martian moon, Phobos. The relevance of this comparison will be made clear later. North and east of the island arc lies the Puerto Rico trench, marking an active subduction zone, and containing the greatest depth in the North Atlantic Ocean. Oceanic crust produced at the mid-Atlantic Ridge is subducted here, fixing the Caribbean plate in its place while the North American plate continues to move westward. There is a less westward movement of the South American plate because the entire width of the continent is held in place by the impact site that formed the Amazon Basin. On the ocean floor in the eastern part of the Venezuelan basin is a feature known to oceanographers as the Aves Swell. Its granodiorite makeup suggests a peninsula, an extension of the Guyana Shield, existed there prior to the impact. This granitic rock overlies the basalt crust due to its lower density. The Aves Swell has been described in scientific literature as an ‘extinct island arc’, but there is no evidence to support this. By comparison, the Philippine plate in the western Pacific Ocean has produced extinct island arcs because the western boundary of the plate is being subducted to the west. Although the Caribbean plate does end at a subduction zone beneath Central America, the plate itself is not being subducted there. The Middle America Subduction Zone dips east, and is subducting lithosphere produced at the East Pacific Rise. Not all of this granodiorite (which is similar to granite, but with less quartz and different feldspar ratios) sank to the bottom of the sea. Some constitute the ‘Gorda Baths’ area in the British Virgin Islands. Impressive rounded boulders up to 40 feet in diameter occur next to tidal pools at the edge of the sea. Such a granodiorite complex is unique for these islands, as is the notable absence of fracturing of the huge boulders. 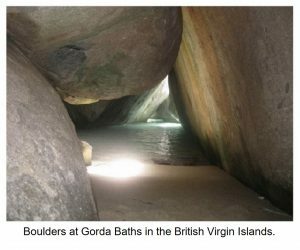 They do not fit the normal model for ‘exfoliation’, which is a common form of rounding of granite by weathering and are, presumably, the result of processes associated with the adjacent impact site. It has been claimed that the Caribbean plate, with its distinctive seafloor features, moved in from the Pacific, but this did not happen. Until the time of the impact, the Caribbean plate was part of the North American plate, and the entire Caribbean/Gulf of Mexico region was a bay of the North Atlantic Ocean, which was devoid of islands. The nature of the seafloor, with its deep trenches and ridges, reflects the movement of islands as they moved away from Central America. Geophysical investigations have revealed that the Caribbean Plate is not typical of oceanic crust in several ways, but given its history and structure, this is hardly surprising. The Bahama Islands are not depicted on my ‘Before Impact’ map as it is probable that they did not exist at that time. The Bahamas consist largely of sand deposits left by the most recent oceanic flood. The southern limit of the Caribbean plate is marked by a fault extending westward from the south limb of the lava pool, partly beneath continental crust, and terminating at the Middle America Subduction Zone beneath Central America. The ‘South Fault’ may have a simple form in the mantle, but in the overlying crust, it is complex. The Middle America Subduction Zone dips east beneath Central America, where oceanic crust is subducted that formed at the East Pacific Rise. This has resulted in an active volcanic zone along all of Central America. The eastward plunge of the Middle America Subduction Zone has been an important factor in the development of the physical geology of the Caribbean Sea. Twelve hundred kilometers (750 miles) to the north, the ‘North Fault’ extends from the north limb of the lava pool to the Middle America Subduction Zone. It can be traced west from the island of Hispaniola as the Cayman trench, intersecting Central America at the head of the Gulf of Honduras and terminating at the Middle America Subduction Zone. The North Fault is less complex than the South Fault because it passes through oceanic crust for most of its length. The North Fault marks the north boundary of the Caribbean plate, which was broken out of the North American plate by the impact that formed the Venezuelan Basin. The iconic form of the Gulf of Honduras seabed is characteristic of land that has been torn apart. 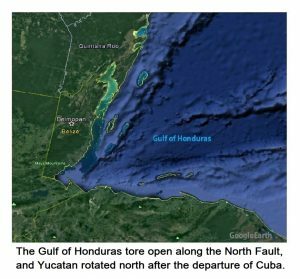 In this case, the crust was severed by the North Fault, allowing the Yucatán Peninsula to rotate northward after the departure of Cuba. Being so young, the entire area of the Caribbean Sea provides an unparalleled opportunity to study the effects of a major impact on local geography. 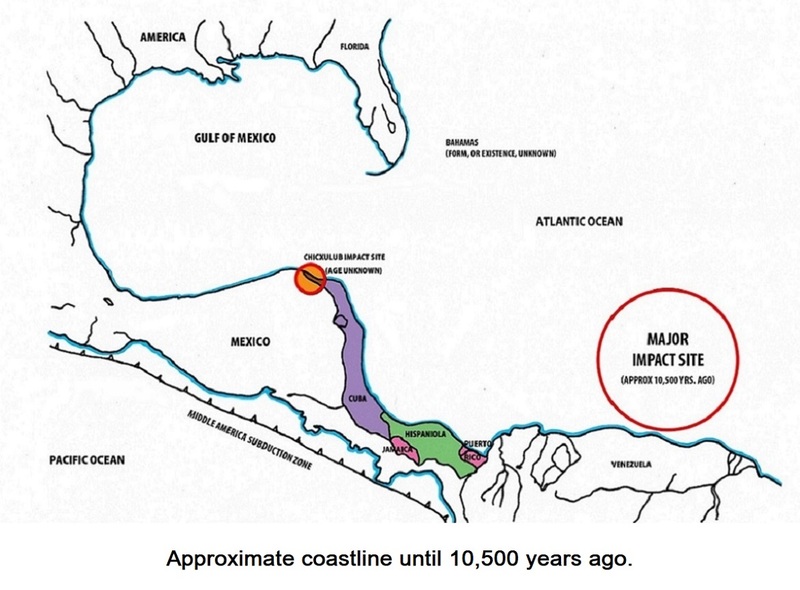 Impacts affect shorelines, mountain ranges, and ocean depths, and the illustration indicates the influence of the eastward-dipping subduction zone. An interpretation of the Caribbean area as it was before the islands split off from Central America is presented. The present major islands of the Caribbean Sea (the Greater Antilles) were broken out of the mainland by strong currents in the mantle that were directed between the two regional (North and South) faults. The mantle currents were deflected upward by the eastward plunging subduction zone, breaking off parts of Central America and moving them eastward. 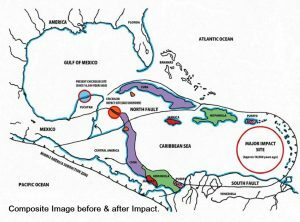 Cuba’s rotation to the north was due to a lingering attachment to the Yucatán, and to a beckoning subduction zone along the north limb of a probable reactivated impact site that controls Cuba’s arcuate northern coastline. This arc trends along the eastern coastline of Yucatán to Honduras. 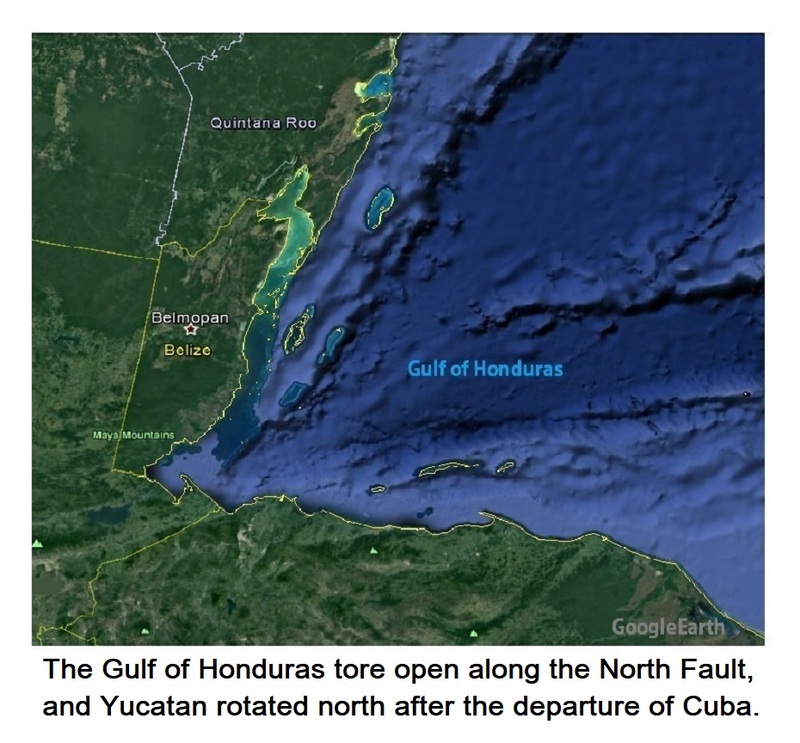 As it rotated, Cuba moved across the North Fault to rejoin the North American plate. Yucatán now encroaches upon the Gulf of Mexico which is itself, the product of a major impact. As the Yucatán rotated to the north, it abandoned a modestly sized impact site on the bottom of the sea, approximately where meridian 85o west crosses the Cayman Trench. The upper part of this impact site is well known to geologists as “Chicxulub”, named after a nearby Mexican village. It had long been suspected that an asteroid impact had been implicated in the catastrophic ending of the Cretaceous period, but scientists have elevated this unexceptional site beyond all reason, clearly because they don’t know how to recognize larger ones. 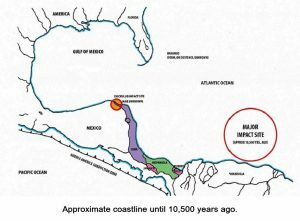 Two absurd claims made for it are that it is “the third largest impact structure on Earth”, and that it was “responsible for the mass extinction of the dinosaurs” occurring at the K-T (Cretaceous-Tertiary) boundary, 66 million years ago. The Chicxulub site was conveniently dated at 66 million years, so once again the scientists had exactly what they required. Determining when an impact site formed can be challenging. The result, however, is dependent upon the algorithm that the scientists apply. It sometimes depends on analyses of samples that are collected away from the site itself, and in such cases, it is essential that the association is valid. In the case of Chicxulub, dating was made on the basis of unrelated rock sample results from Montana, as well as the presence of small impact melt spherules from Haiti that were assumed to have an association. There comes a time when one may need to take a step back in order to assess exactly what is being determined. When one really and truly and with all of one’s heart wants a particular result to work out, if often does. 40Ar-39Ar dating is complicated, and the more complex a procedure, the greater is the opportunity for the exercise to go off the rails. 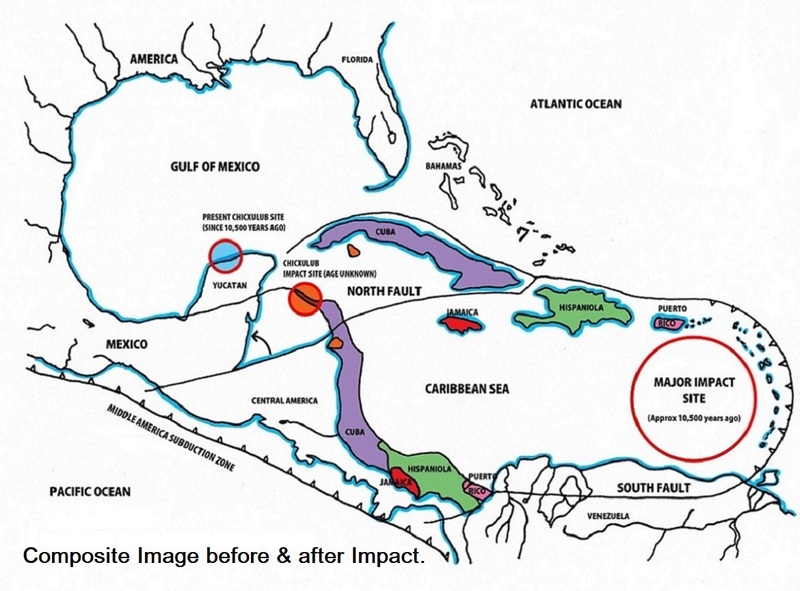 Some effects that have been attributed by scientists to the Chicxulub impact range from the wacky to the preposterous. The consequences from this relatively minor impact have allegedly included Earth’s entire surface being “broiled”, sunlight being blocked from reaching Earth’s surface, and “the dinosaurs going extinct due to a worldwide cessation of photosynthesis”. One should keep these claims in mind when considering that after the Venezuelan Basin impact, which has an area of some 10 to 20 times that of Chicxulub, and represents an energy level at least hundreds of times greater, there were human survivors not far away. When an island moves across the sea it doesn’t travel as a ship through the water but is carried along on mantle currents which are subducted before it. The number of hidden impact sites on parts of Earth’s crust is on a lunar scale, and they stand ready to provide temporary subduction zones to moving lithosphere whenever required to do so. On a physical map of the Caribbean Sea, one can recognize the paths these islands took. The ghosts of ancient craters persist indefinitely, until the ocean floor is reworked from a mid-ocean spreading center, or by another impact. Movement of the Greater Antilles by up to 1,500 km (over 900 miles) provides insight into the degree to which the geography of the Caribbean has changed. The total time required for the movement of Cuba and Hispaniola might have been several centuries, with the initial movement being more than a million times as fast as the 16 centimeters per year spreading along the East Pacific Rise, which scientists describe as “very fast”. The western edge of Central America is being buoyed up by oceanic crust generated at the East Pacific Rise, which is being subducted. This forces the eastern edge to float lower, as one edge of a plank floats lower if the opposite edge is lifted, and which may have led to the formation of sinkholes in the vicinity of Chicxulub. Major islands broke off and began their journey across the sea. Cuba moved away first, and then Hispaniola, followed by Jamaica. The island of Jamaica has been interpreted as part of an ‘island arc’, presumably because it wasn’t otherwise clear how it could have ended up in the middle of the Caribbean Sea. It is common for islands to have mistaken interpretations of their history. Puerto Rico was next, with the Virgin Islands breaking up as they followed. The Netherlands Antilles began to drift away from the Venezuelan coastline but traveled only a short distance. The Venezuela Basin impact directly affected almost three million square kilometers (1.16 million square miles) to the north and west. Its influence, however, also extended to the east. The distance from the Venezuelan Basin to the Mid-Atlantic Ridge is only 2,000 km (1,240 miles), or 20% less than the distance between the impact site and Central America, from which huge islands were torn out of the mainland and moved across a sea. Powerful mantle currents may also have traveled east to the Mid-Atlantic Ridge. (See: Chapter #4. Atlantis). Writing in ‘Planets of Rock and Ice’, Clark R. Chapman writes (page 14) “Since the [prehistoric] formation of the Arizona Meteor Crater…no other human beings have witnessed the nearly instantaneous creation of such a large landform”. This crater, just east of Flagstaff, Arizona, is a remarkably well-preserved meteorite-impact crater which is a popular tourist attraction. 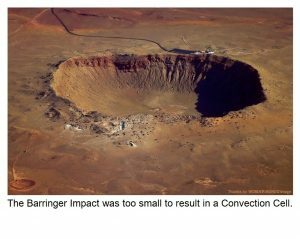 ‘Barringer Crater (also called ‘Meteor Crater’) is roughly 4,000 ft. (1,200 m) across with a depth of some 560 ft. (170 m). The impact resulted from an iron-nickel meteorite which delivered far less than the amount of energy required to form a convection cell. All authorities have the same story to tell as to its age, which, by complete agreement, is “about 50,000 years.” The problem lies in the total absence of evidence supporting this notion. If it had really been subjected to a rapidly moving oceanic flood, kilometers deep, 10,500 years ago, evidence for this should be readily apparent. Flood water would have caused massive erosion of the crater walls vertically and by horizontal vortex currents. Erratics would likely be common within the crater, which would be at least partly filled with stratified sediments. In such an arid environment, the upper layers would include evaporites, including calcrete. Calcareous tufa, deposited by marine algae, would have formed on rocks along transitory shorelines as the water evaporated, just as in every other western American basin. Marine shells and fossils, at least microfossils such as Protozoa, would be present in the sediments. The absence of all of these indicators shows that the Barringer Crater formed after the most recent oceanic flood, and not before. This suggests the asteroid was associated in some way with the major one that formed the Venezuela Basin since it must have impacted soon after. If it had occurred much later, after the plains had been repopulated, legends of this event would likely be prominent in local Indian oral history. An obvious proof of some of these claims is to apply 40Ar-39Ar dating to cored basement samples from the Venezuelan Basin and the Columbian Basin. Samples from these locations were collected by the Glomar Challenger and their ages have already been determined by the 40Ar-39Ar method. Samples are still available to approved researchers (of whom I am not one). Their age is approximately 10,500 years, instead of the 90,000,000 years that has been claimed. (That’s slightly more than 0.01%). Why is there so much resistance to change in science? Therefore, scientists don’t like change. When change threatens to discredit their life’s work, they especially don’t like change.